So, the more I use Go, more I like what I’m getting. It’s one of the very few languages that guides you to write better code right off the bat by making it easy and not pedantic. I have a big rant in my head about this but I’ll save you the pain. This was one thing my vim setup was missing. As my go programs became bigger, I kept thinking, I’d really like better autocomplete and, heck, even syntax highlighting. I’ll focus on two ways to do this for vim, one without using Pathogen, Vundle and one using Pathogen ( I don’t use Vundle but the idea is the same ). I tend to install go from source (the build system is actually pretty fascinating, but I’ll save that for later). So, assuming your go binaries are stored in /opt/golang, you want these settings in your $HOME/.bashrc or similar files. My $GOPATH is generally at $HOME/.go keeping in convention with lots of other programming languages, tools I use. That’s a vim setup, now just copy that to your $HOME/.vim directory and you have filetype detection and syntax highlighting goodness. So, if you’re an experienced vim w/ pathogen user, you’d have figured out that you could totally dump that into a git repo and put in your bundle. You could do that or use someone else’s over at github.com/jnwhiteh/vim-golang. Using Vundle is the same idea, except you add the git repository in your config file. Remember in step 1 where we added the $GOPATH/bin in your $PATH variable? This is where it will come handy. So, if you’ve ever run the go get command to get packages, if the package delcares an executable, it will be placed in the bin directory. In our case, it’s an autocompletion daemon called gocode. The vim scripts just look for gocode binary in the shell, you should be all set. There’s a repo that’s amenable to using with pathogen at github.com/Blackrush/vim-gocode. It’s the same process as the enabling syntax highlighting, just clone or get the repo as a submodule. So, now you should have Omnicomplete support for it.. if you have SuperTab installed, it should be mapped to Tab key otherwise <C-x><C-o> would work for autocomplete goodness. Gotags - A ctags compatible tags generator for go.. it’s still rough on the edges. 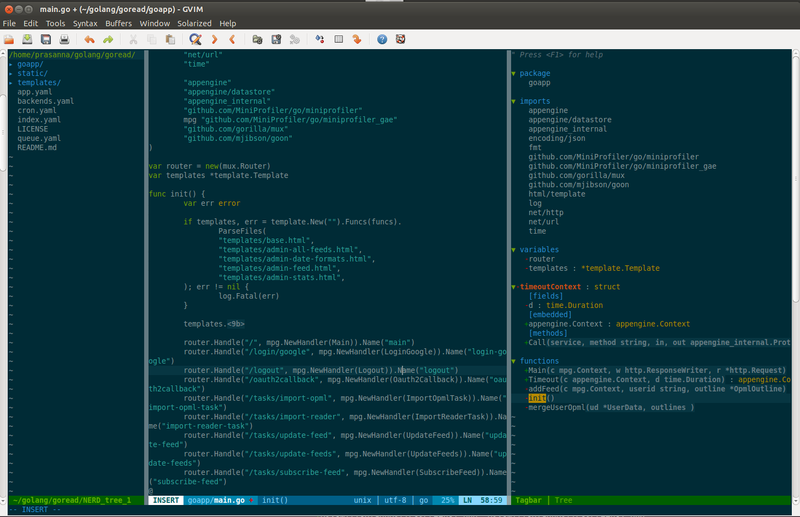 So, here’s what my current vim setup looks like for Go. I’m experimenting with gotags right now. It’s not quite ready yet. It segfaulted vim once for me, so I’m somewhat reluctant to hype it up too much. If you want the exact setup like mine – with Powerline, Syntastic, etc.. feel free to clone/fork my vim-config at https://github.com/prasincs/vim-config.